It’s real: I’m going to be a Peace Corps Volunteer! Hi everyone! As many of you know, I graduated from Oberlin College in May 2010 and spent much of the spring semester applying, interviewing and filling out medical forms in hopes of joining the Peace Corps. On July 8, I received an official “invitation to serve”! So, on September 17 I will embark on an exciting 27 months of teaching secondary English as a Foreign Language (TEFL) in Ukraine. This blog will help me keep in touch with all of you, as I will post information on Ukraine culture/politics/history/religion/food as well as my experiences once my service begins. Hope you’ll stay in touch! Ukraine is the second largest country in Eastern Europe (after Russia, of course), and has the fifth largest population in all of Europe: almost 47 million. Ukrainian is the official language. 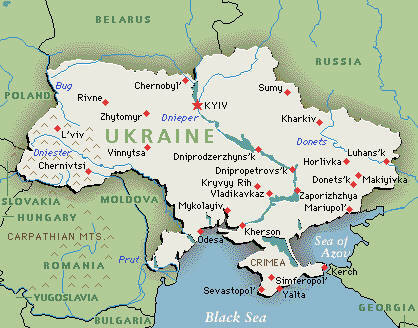 The country shares borders with Russia, Belarus, Poland, Slovakia, Hungary, Romania, Moldova, the Black Sea & the Sea of Azov. Kiev (Kyiv) is the capital. This entry was posted in education, geography, Peace Corps, pictures, travel on 10.07.2010 by taplatt. Two of my roommates are from Ukraine! I'll be very excited to read about your experiences! Good luck, have fun and congrats! !